As much as we don’t like to admit it, sometimes we do struggle with things, and you wouldn’t think that jars or bottles would be a problem, more occasionally, for me, beings as I’m male, tall and strong (ish), not at all. But to to be honest, i’m still a humble bloke and admit that, from time to time, I have struggled to open bottles and jars before now. Now were not all the same, and you will find most able bodied people will have varying degrees of problems opening containers. But, imagine if you had a disability that made it impossible to open even the easiest of containers, imagine your struggle with that one odd jar or bottle every blue moon, and pretend you had to face this struggle every day…. You’re now thinking exactly what I’m thinking. Conditions such as arthritis, especially in the hands or wrists, cause impairments to your strength of grip, and what some people do without even giving it a minutes thought, is a daunting task for others due to lack of grip strength, and more often than not met with excruciating pain. My Mum struggles with opening containers all the time ( that isn’t my Mum in the pic by the way ), and I gave her some of our Tenura jar and bottle openers to help her out ( of course, it used to be me who opened everything when I lived there ), and she finds them a revelation. My Mum told me how much easier opening containers has become since using these, with them being really comfortable to use. Posted in Arthritis Aids, Assisted Living, Daily Living Aids, Independent Living and tagged Arthritis Aids, bottle, disability, disabled aids, jar opener, tenura Arthritis Aids, tenura on 1st June 2012 . 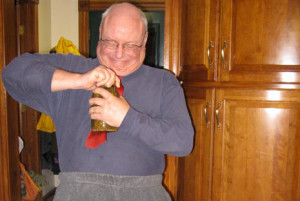 Arthritis causes loss of grip strength in many people, hand movement can be painful and one sharp hit of pain could have even more painful consequences, especially when it comes to using sharp kitchen utensils. The use of knives in the kitchen is a risky business anyway, a lack of concentration could mean an injury, but with arthritis, the risk of injury could be greater. 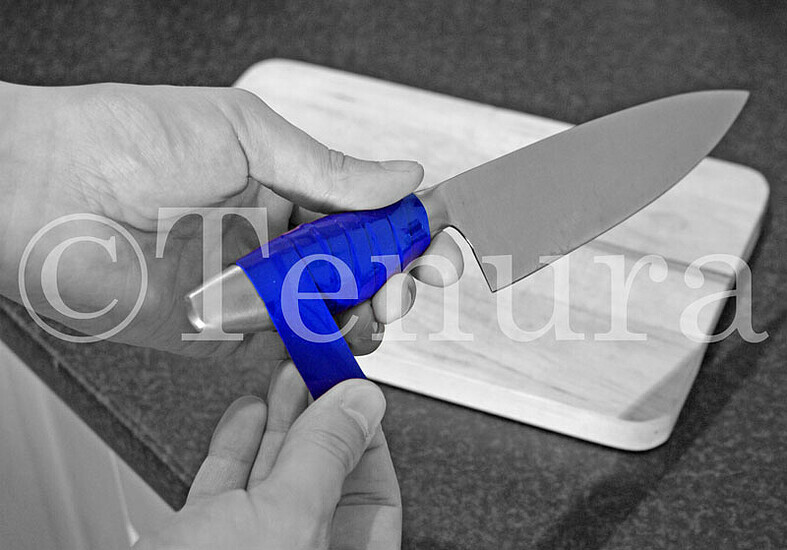 Tenura anti slip grip strips are the perfect arthritis aid for this particular job, allowing you to enhance grip on the handle of the knife, as well as build up the handle to a more manageable size that your hand feels comfortable with, relieving the joints and allowing them to move as freely as possible, maintaining control of the knife. Using Tenura anti slip grip strips will increase confidence and allow you to perform daily tasks freely without struggle. Take a look at our range of arthritis aids and see which could work well for you in your daily activities. For more detailed information on arthritis and help with understanding and living with the symptoms, please visit the National Rheumatoid Arthritis Society website and join the ever-growing community. Posted in Arthritis Aids, Assisted Living, Daily Living Aids, Independent Living and tagged Arthritis Aids, tenura on 9th May 2012 .